3400 Overton Park Drive Atlanta,GA. Please join us on Friday, May 3rd for a tour of the new Synovus Atlanta Flagship Building at Overton and learn how the bank of here is changing the face of the traditional financial service office to better serve their clients and to recruit and retain the top talent that has solidified Synovus as an industry leader. Synovus is deeply committed to serving communities across the Southeast from major cities to main street hometowns and has never lost sight of what drives their corporate success- people. The Synovus story was born from one simple act of kindness and a deep understanding that caring for people is what matters. A tradition of service began in 1888 with a local Georgia mill worker losing her hard earned savings as the hem of her dress was entangled in factory machinery. Noticing her struggle, an executive offered to secure her money as well as other workers in the company vault and pay them interest; these humble deposits served as the keystones of what would become the Synovus of today. That first customer serves as the model for customer care and is proudly featured in the Overton Atlanta Flagship Building; serving as a reminder to all that helping people and businesses feel secure in their financial future is the Synovus mission of service. The proud history of Synovus is embodied in the design of the new office and is successfully integrated with an eye to the future and the company’s focus on emerging financial technologies and innovations. 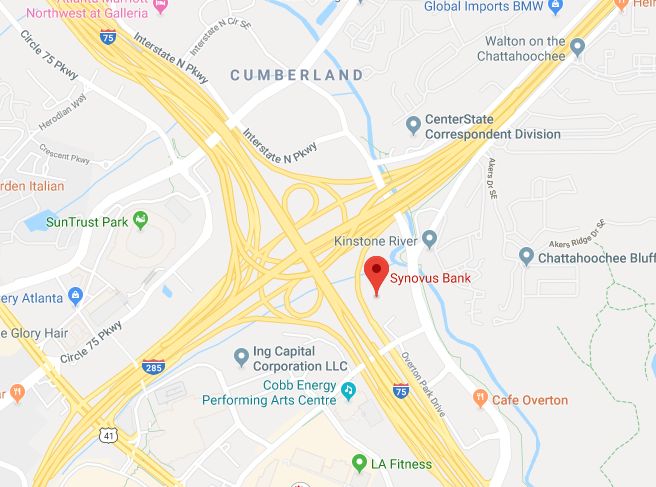 Synovus is the lead tenant of the newly constructed seven-story 3400 Overton Park Drive Building, occupying four floors that consolidates multiple office around the Atlanta area. 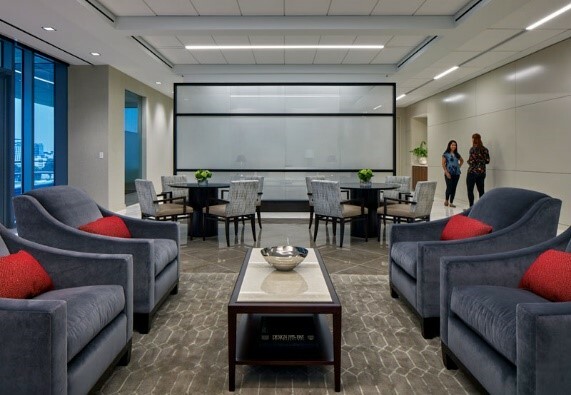 Key Synovus Leadership desired a new home that would support their evolving work culture and provide a center for collaboration, learning, and banking services. Key features of the project include a monumental stair that provides connection between the open and welcoming reception area and the conference facility. Work areas support open communication through a more progressive workstation model and varied meeting areas encouraging both formal and impromptu collaboration, including an employee focused break area. Executive spaces include private offices and communal seating areas allowing for thought sharing and team building. 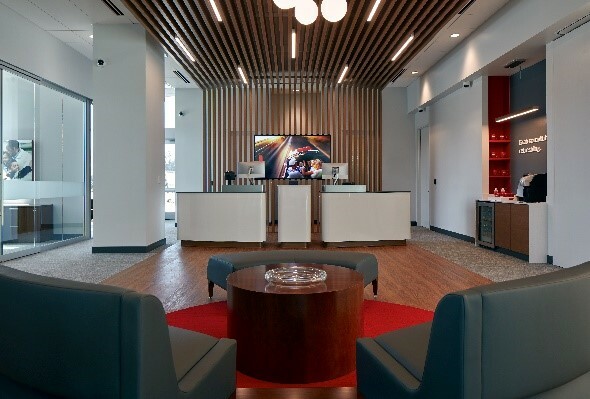 An on-site branch bank highlights the new prototype of a retail inspired experience for Synovus clients and a tailored concierge approach to fulfilling client needs. Security will have a list with your name on it. Visitor parking is available in parking deck. Follow I-75 N to Cumberland Blvd SE in Cobb County. Take exit 258 from I-75 N.
Take right on on Cumberland Blvd SE. Use the 2nd from the left lane to turn left onto Akers Mill Rd SE. Turn right onto Overton Park Dr.
75 South to exit 258 toward Cumberland Blvd. Use the right lane to turn right onto Cumberland Blvd SE. Turn right at the 1st cross street onto Cobb Galleria Pkwy. Turn right onto Akers Mill Rd SE. Turn left onto Overton Park Dr.
Take the exit toward Cumberland Blvd SE. Keep left at the fork to continue toward Cumberland Blvd SE. Keep left at the fork, follow signs for I-75 S/Atlanta. Use the left lane to follow signs for Cumberland Boulevard. Use the left 2 lanes to turn left onto Cumberland Blvd SE. Use the 2nd from the left lane to turn left onto Akers Mill Rd SE. Turn right onto Overton Park Dr.